"41AN1-12, Burial E-3" by Timothy K. Perttula and Robert Z. Selden Jr.
DECORATION: The upper body has a row of 10 hatched pendant triangles suspended from a single horizontal engraved line. On the remainder of the body are two vertical panels with two deeply-cut vertical engraved lines. On the first panel, there are a series of small hatched pendant triangles on each vertical engraved line. The second panel has eight hatched pendant triangles and eight small engraved semi-circles on the two vertical engraved lines. Hume Engraved, var. 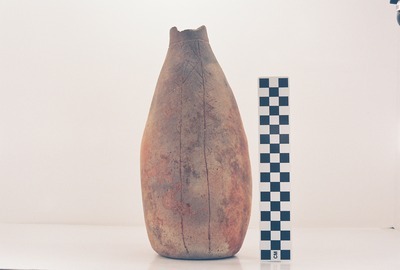 unspecified (Vessel 41AN1-12).